18in x 4in x 15in. Invite springtime in any time of the yearwith this snuggly friend and pillow. 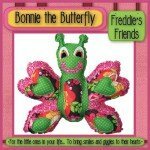 This fun butterfly willflutter in your favorite child?s heart for allseasons to come.